When the HerschelSpace Observatory reaches its orbital perch, it will be set to boldly lookwhere no telescope has looked before. Herschelwill be launchedthis week by the European Space Agency (ESA), in tandem with the Plancktelescope, and its arrival marks a new chapter in infrared astronomy. Infraredlight is better known to most of us as heat. But heat isn?t emitted just by thehottest objects ? even an ice cube gives off infrared energy. Celestialobjects with surface temperatures of about 3600 degrees Fahrenheit (2,000Celsius) ? cold compared to the Sun which has a surface temperature of about 9900F (5,500 C) ? actually radiate most of their energy at infrared wavelengths.Aging stars, planets and dust are all objects in the universe best observed inthe infrared, appearing as dark blobs in the visible spectrum, but untilHerschel, infrared observations of these objects have been incomplete. For onething, ground-based telescopes are not as effective at these observationsbecause infrared light is largely blocked by water in Earth?s atmosphere. Otherspace-based missions have only looked in particular infrared wavelengths.Herschel will offer a more comprehensive look from the clearwindow of space. "Instead oflooking out through a dirty window, you?re going to get a clean view,' said PaulGoldsmith, the NASA project scientist for Herschel at the Jet PropulsionLaboratory in Pasadena, Calif., which provided some of the key technology forthe telescopes..
With its11.5-foot (3.5-meter) mirror (the largest ever sent into space and almost 1.5times larger than the Hubble Space Telescope), Herschel will be able to exploremore in the far-infrared than any other mission, both within and outside ourown galaxy. Herschel will collect almost 20 times more light than any previousinfrared space telescope. Thetelescope (named for the astronomer William Herschel who discovered infraredlight 200 years ago) will detect light from objects as cold as minus -440degrees F (-263 C). With thetelescope, astronomers will be able "to really get a good view of the universein the far-infrared," Goldsmith said. Within oursolar system, Herschel will examine asteroids, Kuiper belt objects and comets,which are fossils of the early solar system that could hold clues to the rawingredients that formed the planets, including Earth. One ingredient ofparticular interest is water. "One of themost interesting targets for Herschel is the same water that blocks our view ofthe universe," Goldsmith told SPACE.com. Someastronomers think that comets, which are sometimes thought of as "icysnowballs," could have supplied the Earth?s water. As comets near the sun intheir orbit, their ice melts into water ? Herschel can detect the water?ssignature, Goldsmith explained. Herschelwill also look for signs of water in interstellar clouds and compare it to thewater signatures in our own solar system, to "see how we?re connected,"Goldsmith said. Astronomerswill also be looking for another molecule familiar to us earthlings ? oxygen.It is predicted to be abundant in the interstellar medium, but so far noinstrument has definitively detected it. In theMilky Way, Herschel will study star-forming regions to get a first glimpse atthe stages of early star formation and some of the galaxy?s youngest stars. ?Baby stars are enshrouded in wombs of cold gas and dust. "You justcan't see what's going on inside until the star is actually born," Goldsmithexplained. But Herschel should be able to see through the clouds to see theinfant stars beyond. "We'll getsome quite beautiful images, we think, of star-forming regions," Goldsmithsaid. Astronomersalso hope to use Herschel to peer into the dusty debris discs that encirclestars, where planets are thought to be formed. 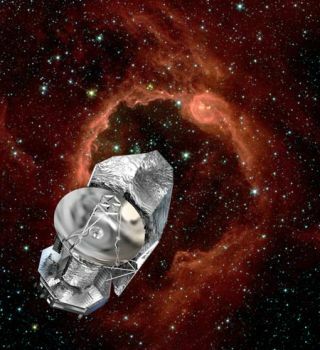 Herschel willalso investigate star formation outside our own galaxy. Astronomers know thatstar and galaxy formation got started fairly quickly after the Big Bang andthat star formation was much more intense in theyounger universe. The young galaxies that churned out stars then would haveshone brightly in the infrared, making Herschel an ideal telescope to observethem and better understand the stellar baby boom in the early universe and howit might have differed from star formation today. "We hope tounravel that a little bit," Goldsmith said. Thegalaxies are thought to make up a diffuse infrared cosmic background. TheSpitzer Space Telescope can just barely resolve these galaxies, but Herschel,with its sharper focus, should be able to "nail down" the source of thebackground, Goldsmith said. OnceHerschel reaches its final destination at the L2 Lagrangianpoint of the sun-Earth system ? a gravitational stability point in spaceabout 1 million miles (1.5 million kilometers) from Earth in the oppositedirection of the sun ? it needs a couple months to get up and running. But onceit is, it will have 3.5 years to get the "first really in-depthlooks" at the hidden infrared folds of the universe, Goldsmith said.